Gelato—what is it? Why does it taste so good? And where can we get some right now? Gelato is an Italian-style ice cream featuring a thick texture and some unusual flavors. 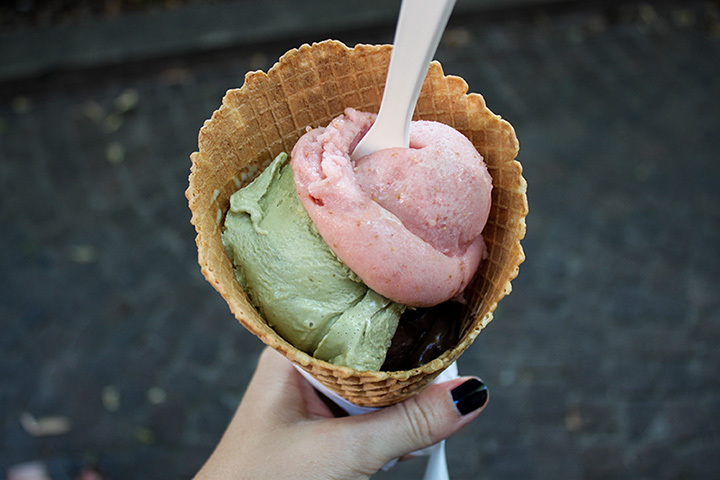 Take some notes, because here are 10 great options for gelato in Michigan! Found in Ann Arbor and East Lansing, Iorio's Gelato has just about everything you could ask for in gelato. Start with a wide variety of gelato flavors, and expand the menu out to include plenty of coffee beverages to go with it, and you've got a terrific package. Then, just to top it off, remember that the Ann Arbor location is open until 10 p.m. every day, which means even after dark, you'll still be able to enjoy that sweet creamy treat. The first gelato shop in Kalamazoo, opened last year, Amorino Gelato is a groundbreaker just on the strength of that point. Amorino Gelato is actually part of a chain operation that, previously, was only found in major world cities like Las Vegas and Paris. Now, this spectacular continental taste has made its arrival in Michigan, offering cold, creamy goodness without the intermediary issues of additives, dyes, and anything but natural ingredients. It shouldn't surprise anyone that a beach town knows frozen treats. Grand Haven's Santo Stefano del Lago is no exception, offering a full-service gelato bar for visitors to enjoy. Of course, it actually offers more than that, including not only imported pasta and family-recipe sauces, but also a variety of other groceries, wines and more making for a potentially exciting evening-in in the making. Midland's Journey’s Coffee Shop boasts a wide range of food and drinks available for the hungry and thirsty that cross its doors, and on that hefty list of offerings is found that sweet treat known as gelato. Featuring not only “many flavors” of gelato, but also coffee, tea and cider drinks in varying dimensions and preparations. Since it's found in front of the Messiah Church, there's also a chance to get in on worship opportunities while in the area, making it a potentially uplifting gelato afternoon. Palazzolo's, in Holland, was built on a combination of three weeks' work and a second's decision. Featuring not only gelato, but also sorbet, frozen yogurt, and even vegan ice cream, Palazzolo's Artisan Dairy will offer gelato on a made-to-order basis, from only the best in ingredients to provide a taste of the upscale for a reasonable price. Throw in the fact that there are over a hundred different flavors potentially available—though not all at the same time—including flavors built around fresh fruit and liqueurs, and you've got an experience ready to go. Leave it to Traverse City to take a place that bills itself as the coffee capital of the north and use that status to add several flavors of gelato to the mix. Offering several flavors in a variety of presentation styles—from waffle cone to cake cone to the cup and beyond—Espresso Bay will offer you the warm up, the cool down, and most anything in between. Grand Rapids' entry into the gelato scene, Love's Ice Cream, features most everything you'd expect, starting with treats that are “organically principled” and “made from scratch.” That's a great combination, and Love's Ice Cream's gelato is actually sufficiently so made that it qualifies as vegan. It even boasts grass-fed dairy ice cream. Oh, and if you're in a mind for free ice cream, Love's will offer it up for anyone...on their birthday. Just sign up and enjoy your free birthday treat. Part of the operations in Campus Martius Park in Detroit, the Gelato Shoppe offers gelato with a noteworthy twist: the option for a cone made from pretzel. The combination of sweet and salty that results is said to be a formidable one taste-wise, and reports suggest that the shop's general manager is known for quietly tasting new recipes all winter before releasing fresh ones into the shop. Formerly the Water Street GelatoWorks in Benton Harbor, Sweet Bar by Mason Jar is under new management and delivering new value as well. Featuring gelato—and gelato shakes as well—the Sweet Bar will also boast an array of floats, coffee drinks and more to offer the biggest in value for those hungry for some sweet, cold treats. Going back to Ann Arbor, we get one great surprise waiting for us: Paciugo. While the gelato makes it well worth considering—flavors are updated daily and cover a pretty staggering range of options accordingly—it's the location that's even better. Paciugo is found in the Rave Cinemas theater in Ann Arbor, making it potentially possible to have gelato and a movie. That's a winning combination, particularly on a hot day. Just ask anyone who's ever ducked into a theater on a summer day.